Check out the many fine Irish organizations and clubs to join, educational opportunities and scholarships to pursue, trolley tours of Irish neighborhoods to enlighten, traditional music sessions to attend, Irish theater to entertain, festivals to hear the music and experience the culture, Bloomsday celebrations to commemorate James Joyce, sporting events, genealogy, citizenship, Irish dog breeds, and how about an Irish cruise or a recipe for soda bread? These, plus many more events and opportunities, will keep you busy throughout the year and help you get connected to your Irish. Sharon Shea Bossard has been involved in researching her Irish roots for more than three years. Sharon began to wonder about her Irish when she realized that she and her siblings had no memory of family events or stories to tell their children. The author recalled family stories perceived through parents' whispered accusations, and she grew up believing that being Irish was akin to suffering from a dreaded disease--you knew you had it and lived with it as best you could. Recently becoming curious about her family history, she decided to search for any information regarding her Irish-born grandparents. Old documents revealed a story--one she couldn't ignore. Facts concerning the lives of her grandparents emerged and secrets were uncovered. An overwhelming curiosity directed the author to dig deeper into family records, to travel to the villages in Ireland where her grandparents were born, and to locate family who still reside in those villages. Sharon has just recently discovered what has been a part of her since before she was born, and she has come to know and love that "Irish feeling," the feeling that first called her back to Ireland. 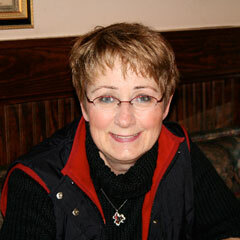 Sharon is an Irish citizen and currently lives with her husband in Lake Zurich, Illinois. She has one married daughter and a son-in-law who also reside in Lake Zurich. The author earned her Master's Degree from Northeastern Illinois University, majoring in Special Education, and taught for twenty-nine years in a suburban high school.